Ardumoto Shield assembled and situated on a RedBoard. 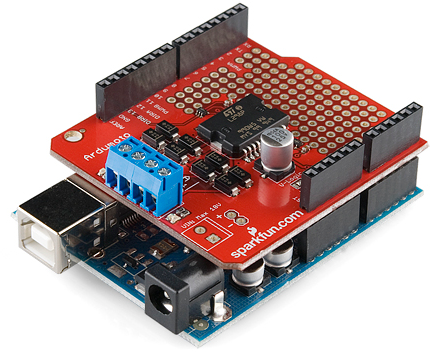 We sell the Ardumoto Shield either alone, or with a set of motors and wheels in our ArduMoto Shield Kit. This kit includes the Shield as well pairs of tires, motors, connectors, and wires. And, of course, it's all stuffed in a classic SparkFun red box (which may come in handy as a robot chassis). Contents of the Ardumoto Shield Kit. 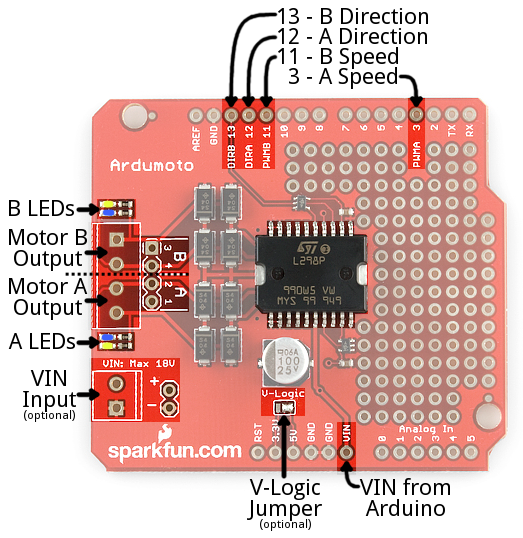 This tutorial covers assembly and use of both the Ardumoto Shield and the Ardumoto Shield Kit. Digging deeper, we'll get into some assembly tips, and finish with an example Arduino sketch. Meet the L298 -- This section covers the L298 full-bridge motor driver at the heart of the Ardumoto. Ardumoto Overview -- A quick rundown of the Ardumoto's inputs, outputs and features. Ardumoto Shield Assembly Tips -- Tips and tricks for assembling your Ardumoto Shield. Motor and Wheel Assembly -- Some open-ended ideas to help you assemble the motors and wheels included with the Ardumoto Shield Kit. Example Code -- Finally, some example code to get your robot rolling. If all you have is the shield, everything but the "Motor and Wheel Assembly" section will apply. To follow along with this tutorial, you'll need an Ardumoto Shield or the Ardumoto Shield Kit, and an Arduino or Arduino-compatible development board. If all you have is the shield, you'll also probably want a couple of DC motors to drive. The Ardumoto can control most small DC motors, like any of those in our DC motor category. You'll also need a handful of connectors to get everything wired up together. 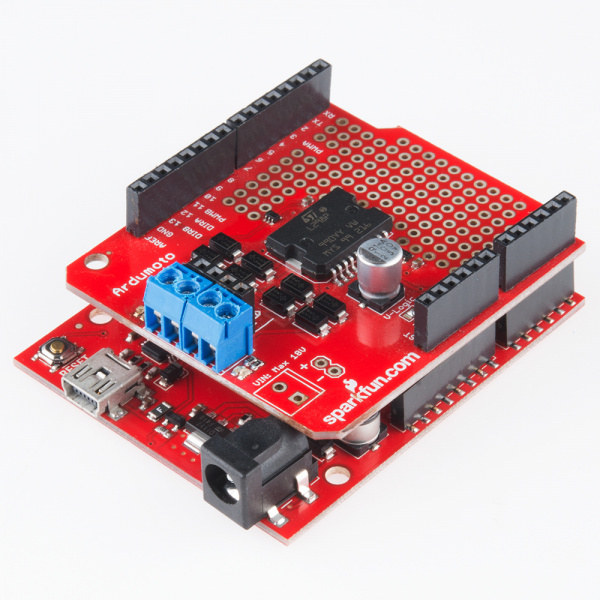 We recommend Stackable Headers to connect your Ardumoto to your Arduino. 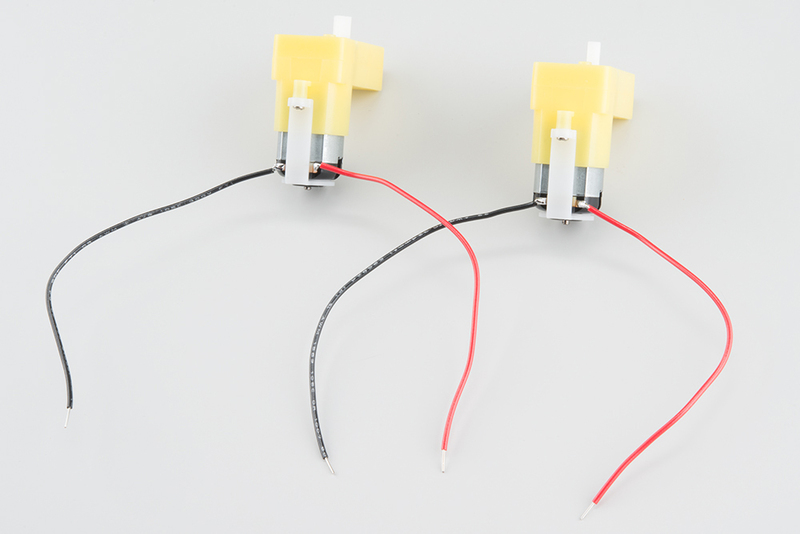 And two or three 3.5mm Screw Terminals to help connect motors to your Ardumoto. Both the Shield and the Kit will require a power source. Batteries are usually your best bet -- we recommend a 9V alkaline battery, which will work perfectly with the included 9V-to-Barrel Jack Adapter. Check the voltage and current requirements of your motor before deciding how to power your Ardumoto project. These specifications vary. 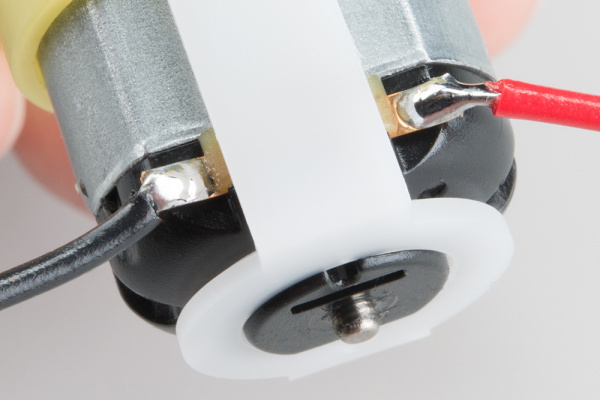 The 65RPM Hobby Gearmotors, for example, have a recommended range of 3-6V, but can be safely powered at up to 9V. We recommend 9V Alkaline Batteries as an easy, if not-very-sustainable option. Dual-cell LiPo battery packs (7.4V nominal, 1000mAh capacity) are also a good option if you're looking for something mobile. 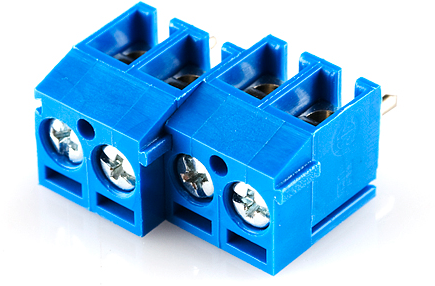 A 9V wall wart can work if your project is stationary. 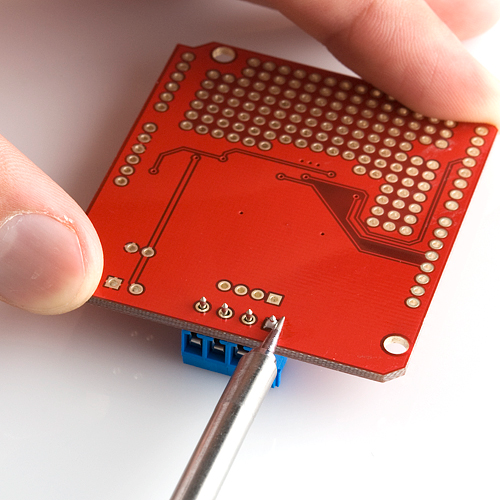 For more help picking a power supply, check out our How to Power a Project tutorial. If you have the kit, you already have a couple pairs of wires, but they still need to be stripped. 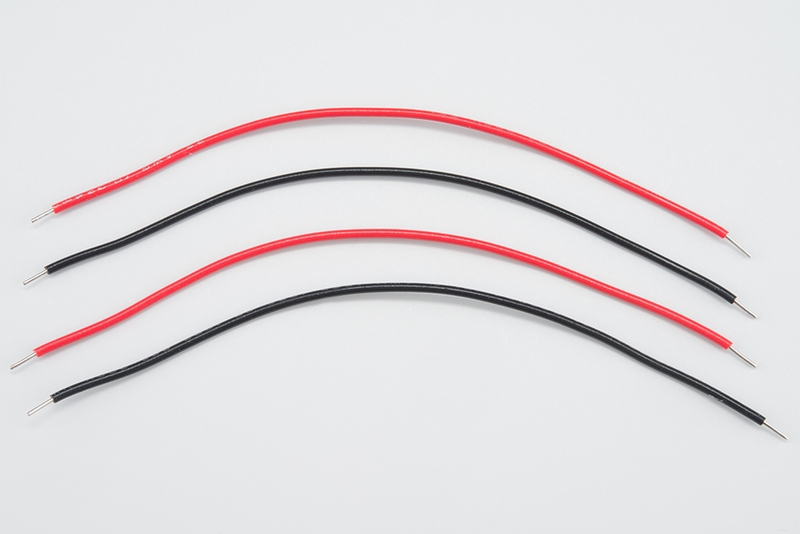 Grab your Wire Strippers, and remove about 1cm of insulation from each end of each wire. Then it's time to solder the wires to your motors. 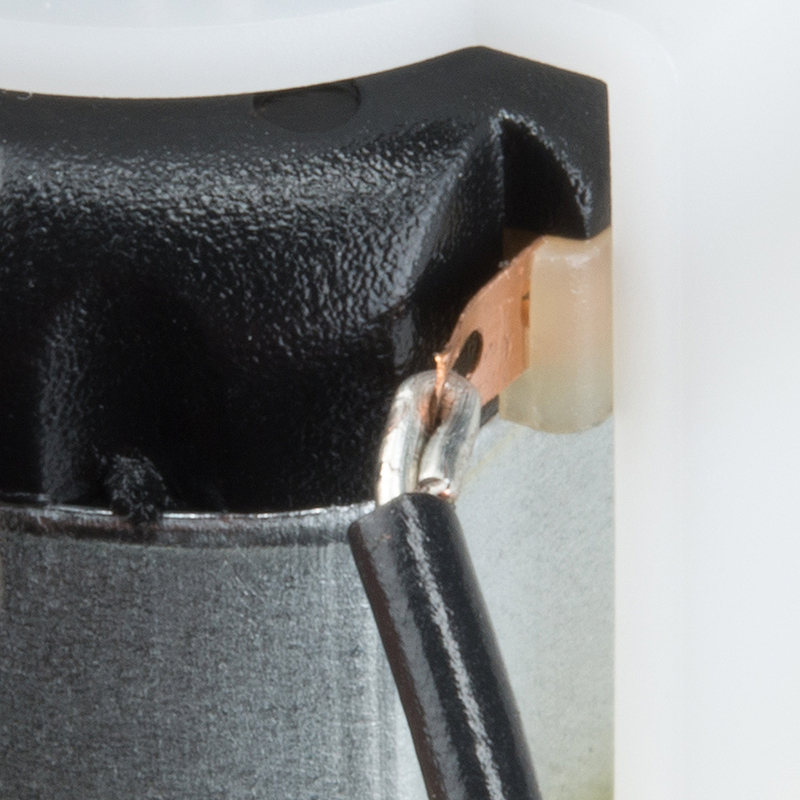 Slide a black wire through the "eyelet" connector on a motor, then use a pair of pliers to crimp it around creating a decent mechanical connection. Careful! The connectors on these motors are very delicate. Avoid stressing them or bending them any more than you have to. We highly recommend globbing each connector with some epoxy or hot glue after you've soldered them. Then coat it with a warm blob of solder. Repeat the same set of steps for the red wire and the motor's opposite connector. Make sure the wires don't short on the motors nearby metal body. Repeating the same set of steps on the other motor, try to match the positions of the red and black wires. And make sure you don't yank the wires too hard now -- those motor terminals are rather delicate. 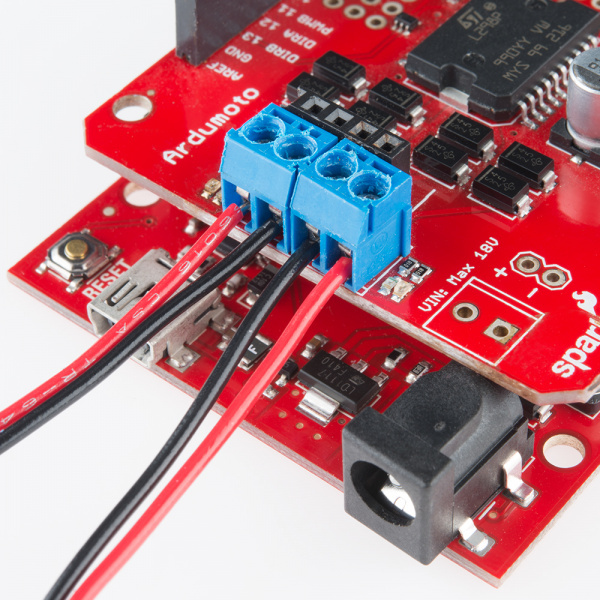 In lieu of screw terminals, you can solder the motor wires into either the 0.1" header or the screw terminal header. If you have the Ardumoto Shield Kit, you probably also have a robust, resplendently red SparkFun box. 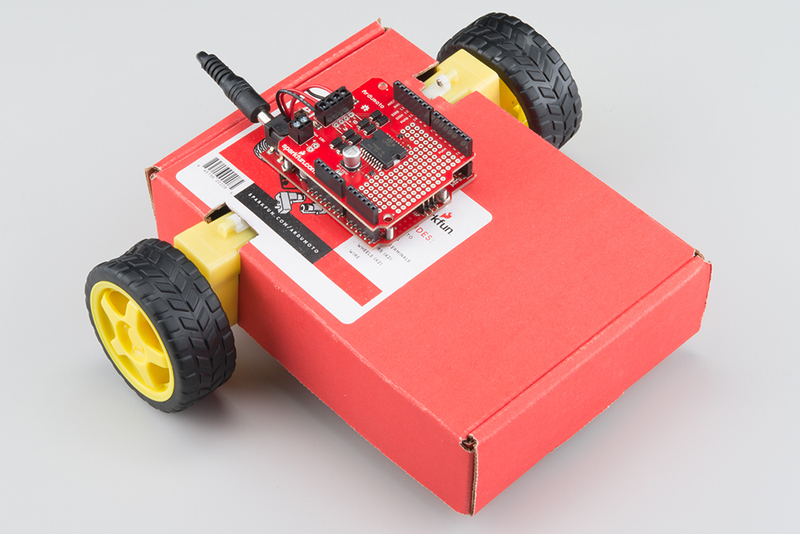 These SparkFun boxes come in handy for all sorts of projects -- including robot chassis! You may want to add a Ball Caster to the front, to keep the box from scraping against the floor. Now time to program the Arduino and make your RedBox-bot mobile. Download the example sketch and upload it to your board. 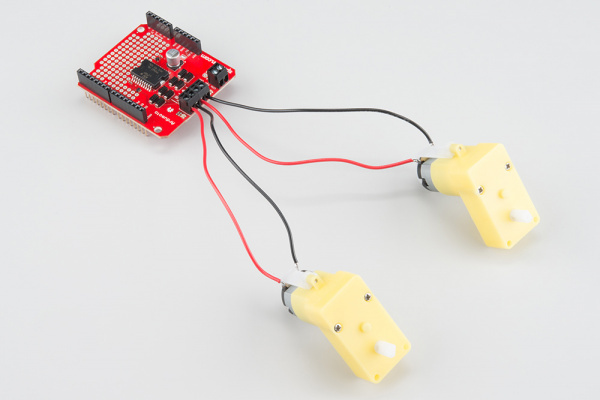 Assembly Guide for RedBot -- If you're looking for a complete, beginner-level robotics platform, check out the RedBot Kit. 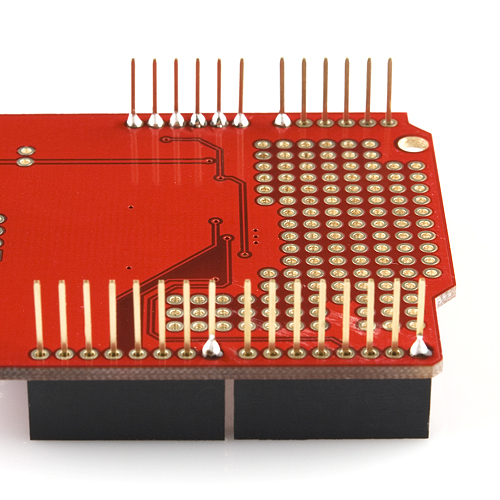 It's Arduino-compatible, and the RedBot Mainboard has a motor driver built into it, so you don't even need an Ardumoto Shield. 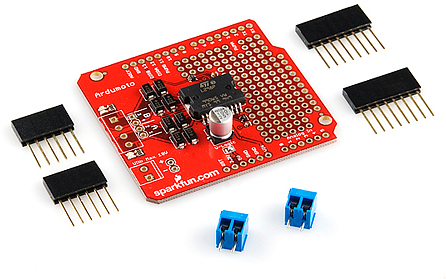 Getting Started with the MiniMoto -- The MiniMoto is a more advanced, digitally-controlled, low-voltage DC motor driver. Great if you need a smaller form-factor motor controller. How to Power a Project -- Batteries? Wall-warts? Solar? If you're not sure how to power your Ardumoto Shield project, take a trip over to this tutorial.